When you start driving for Uber you need to know how everything works. The problem is Uber doesn’t exactly teach you how everything works adequately. Ya, there are some training videos, but with the app constantly being updated some of the information is a little outdated compared to the functionality of the app now. This can make it difficult for the newer drivers that are trying to do everything right the first time instead of making mistakes. The video above is basically how the partner app works but was also created before I started driving for Uber almost a year ago. A lot has changed since then, and it’s difficult to find these training videos on Uber’s website. I honestly can’t remember how I accessed them the first time. Today, I’m going to show you, step-by-step, how to use the Uber partner (driver) app for picking up riders. After you have logged into the Uber partner app and have your vehicle selected with all your documents uploaded, you should see the map of your area just like above. The blue dot represents you and your location on the map. Once you have made it to this point you would simply click “Go Online” which would show “Go Offline” after. You can go offline anytime you decide you don’t want to drive anymore for that day. Once you go online in the app you basically just wait. Depending on the area you are in and how busy it is it can take only a few minutes to receive a ride requests or take an hour or more. When I’m in San Francisco, I get requests left and right. 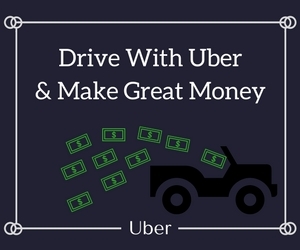 So, if it takes awhile for a request and you are looking to make a lot of money then I would recommend moving to another area with more people so you can receive more rides. Once you do receive a ride requests your phone will start beeping and pop up with a picture like the one above. You can see approximately how far the rider is from your location, the address you will be heading towards, and even the rating of the passenger that you will be picking up. To accept the requests just tap on your phone screen to accept. If you don’t want to accept the ride you can wait about 30 seconds for the blue circular line to disappear and then the requests will get passed onto the next closest Uber driver. Once you have accepted the ride requests just click on the “navigate” button at the top right hand corner of the app. This should connect you to the GPS app that you use on your phone. I personally use Google maps, but there are others that like to use the Waze app. At this point you should now know the name of who you will be picking up once you reach the passenger pick up location. This is important to know especially in areas with a lot of people so that way you can be sure to pick up the correct passenger. After you have accepted the ride requests and reached the destination now you wait for the passenger to get in. A good idea for getting more trips is notifying the rider right away that you have arrived. Uber does notify the passenger automatically as soon as you arrive but can sometimes be delayed. If you want to make it a little quicker you can click on the clipboard above “navigate” and contact your passenger that way. First send a text and then give a call after 5-10 minutes of waiting. Usually after 10 minutes I will cancel the ride if I don’t get any response from the passenger because I can’t wait forever for someone and obviously they weren’t ready when I arrived. Waiting doesn’t make me money which is why 10 minutes is my cut off. Once the rider has gotten in you can swipe right to start the trip. Once you swipe right to start the trip the destination should pop up. Verify with your passenger that this is the correct address before you start driving. Sometimes they will change their mind or have multiple stops along the way. Sometimes the destination hasn’t been entered by the passenger. Simply ask them and punch the address into the Uber app. Click on “Navigate” and start driving to the drop off location. After you have reached your passengers destination it’s time to end the trip. Click on drop off in the partner app and then swipe right to complete the trip. Be sure to make sure your rider has all their belongings so you don’t have to return the items later. The last step before you pick up your next rider. Once you have completed the trip you will be prompted to rate your passenger between one star to five star. Did they give a tip? You can rate your passenger however you feel fit. It’s your decision. Basically anyone that gives me a tip I will rate a 5 star because I’m always happy getting extra cash. Even if it was someone rude. After you finish rating the passenger swipe right to complete the rating and then repeat the process of steps 1-7. When you are finished driving just hit “Go Offline” and have a great rest of your day or night. While there are other features on your app, this one is the most important process to know. It’s how you make money which is the whole point of driving. Since customers rate drivers too make sure you are great to your passenger so you don’t get deactivated for low ratings. If you have any questions, be sure to leave me a comment. You are right. If you accept the trip and want to make it your last trip of the night or to take a break you can just hit the offline button. Finish the trip like usual, and once you end the trip, Uber will double check with you and then place you offline. I always hit the offline button before I start my navigation when I decide to make the current ride my last one. This is an excellent explanation. Thanks. Do you have info on the food delivery part of Uber? I have a 2-door car so they want me to do that. I personally haven’t tested out delivering for UberEats yet so I don’t have a lot of information on them. I do know you can use two door cars for them while you couldn’t if you were driving people around. I live in the San Francisco Bay area. Parking in San Francisco is probably one of the hardest cities to park in because of the population density and the limited amount of parking spaces. I’ve delivered for other food places similar to UberEats and hated it. Driving around the block 20 minutes looking for parking, paying for the meters(Which become very costly), and parking illegally and being ticketed even though it was only 5 minutes. I felt I was wasting too much time and money for the other places I delivered for to be worth it for me. I feel UberEats might not be any different which is why I haven’t tried them. Although I’m sure it would be great for someone that was just planning on using their bicycle.